We’ve received lots of feedback saying more adults would like to take part in SAW projects to develop their own creativity across science and the arts. The SAW Trust have begun a new collaboration with the Writers Centre Norwich(WCN) to provide science-inspired poetry workshops for adults using current science topics as a starting point for writing. There are 4 workshops planned for 2016. The first pilot project took place on the evening of 18th August 2015 and was delivered as a partnership with a group of undergraduate students from the University of East Anglia competing in an international synthetic biology challenge called iGEM ( http://igem.org/Main_Page ). The students wanted a novel approach to exploring the human practices component of their project so the SAW Trust helped the team link with Jonathan Morley from WCN to set up a poetry workshop. Jonathan invited Esther Morgan, a highly experienced poet and workshop provider to lead the poetry session (http://www.esthermorgan.net/). Esther came to visit the students at the Norwich Research Park prior to the session and had an afternoon of tours around the laboratories to see what the students were working on. The poetry session began with a presentation by the students on the science to give all the attending writers an insight into the aims of the research. Esther then took over providing some warm-up activities linked to the science and then got the scientists to break out into pairs with the writers to discuss the scientific language in more detail. 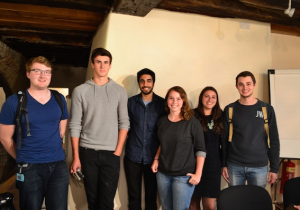 A great selection of poetry emerged from the workshop and was presented at a jamboree for all competing teams by the Norwich iGEM team in Boston, USA, which is the final stage of the competition. The team were delighted to be awarded a gold medal for their project and be rated in the top 5 of all 280 teams for their approach to education and public engagement. The next workshop will focus on antibiotic discovery and is scheduled for February 2016. Please get in touch if you would like to attend a similar event in future. 2015 marked the 150 year anniversary of a presentation of research to the Natural Science Society in Brno by Austrian monk Gregor Mendel, who is regarded as the “father of modern genetics”. In 1865, Mendel presented his work from studies done on pea plants in the gardens of the monastery in Brno that provided the first description of the Laws of Inheritance. To celebrate Mendel’s work and enable children to follow his methods to understand how the Laws of Inheritance work, we ran an interactive stand in the Discovery Zone at the Royal Norfolk Show. The stand provided a mix of hands-on science led by scientists from the John Innes Centre and an art activity that invited children to contribute to the build of some giant pea pods led by environmental artist Ruth MacDougall. 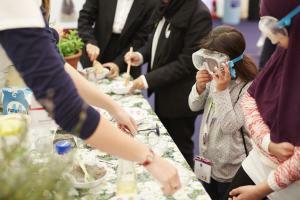 SAW worked with researchers from the John Innes Centre and Institute of Food Research to design a stand for the BBSRC Great British Bioscience festival which took place in November 2014 at Bethnal Green. Artist, Molly Barrett met with the scientists to find out how their research was seeking to understand how beneficial chemicals naturally found in plants are made. Molly then worked with SAW to design four games that explain the key scientific concepts the researchers are using to improve our ability to access these valuable chemicals. Games featured purple tomato, super broccoli, plant-made vaccines and cancer treatments. We also built a 'fact-tree' that was covered in leaves containing interesting plant facts that people could take in return for writing a comment on a blank leaf to hang on the tree. Finally, a hands-on table was set up for people to use well known plant extracts to make peppermint foot scrubs and lavender bath bombs to take away. We also ran the stand at Science in Norwich Day, the Festival of Plants at Cambridge Botanic Gardens, Norwich Fascination of Plants Day for schools and at the Family Science Day in Bury St Edmunds. For the 2013 Festival of Ideas in Cambridge we worked with scientist Andy Osborne who specialises in eye research. We ran a drop-in workshop at the Cambridge Science Centre for families where they could learn about how the eye works and the variety of different eye diseases and disorders that can impact on sight. Andy had some great vision altering glasses that helped people to understand what sufferers of different eye conditions can see. We were joined by artist Jenny Walsh and some sixth form students who invited people to help build a giant eye sculpture to learn more about the rods and cones in the eye. A new festival that celebrates everything to do with light took place in Cambridge in February 2013. For the e-Luminate festival, the SAW Trust worked with the Cambridge Science Centre and artist Jenny Walsh to run a workshop entitled 'Lighting up inspiration'. Families learned about the relationship between the colour spectrum and light wavelengths. Light was then used to create a collaborative piece of art that explored the iridescent properties seen in oily puddles and in nature to create a peacock.